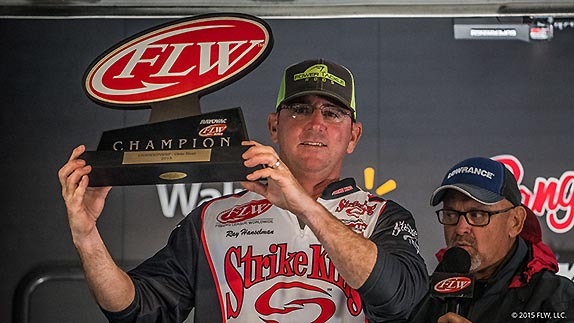 Ray Hanselman's phenomenal 2015 campaign was topped off with a victory at the FLW Series Championship. 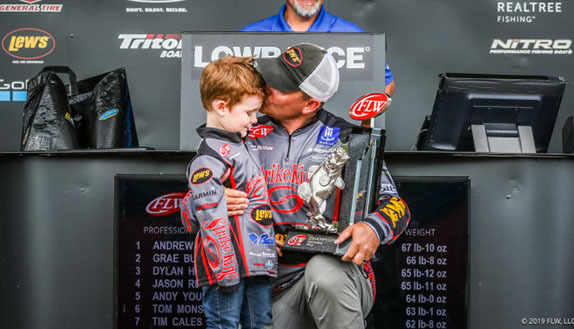 Ray Hanselman accomplished what was undoubtedly the greatest feat in the history of triple-A fishing in 2015, when he won all three Southwestern FLW Series tournaments and the Series Championship derby at the always-stingy Ohio River. Now he's poised to take his first crack at tour-level competition. 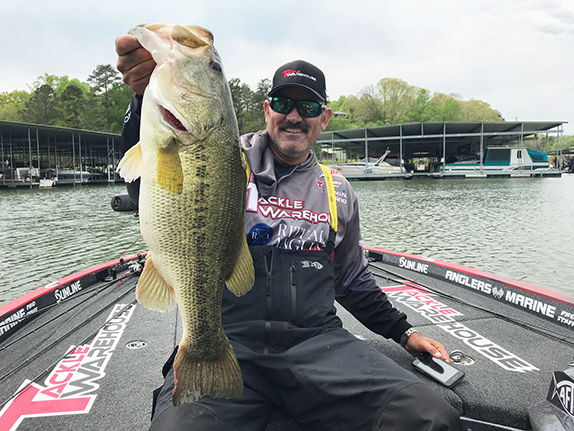 The 44-year-old full-time fishing guide from Texas qualified for the 2018 Bassmaster Elite Series with a 5th-place finish in the Central Opens points race. With several events in his home region, on bodies of water with which he's familiar, he likes the layout of the first half of next year's Elite schedule. 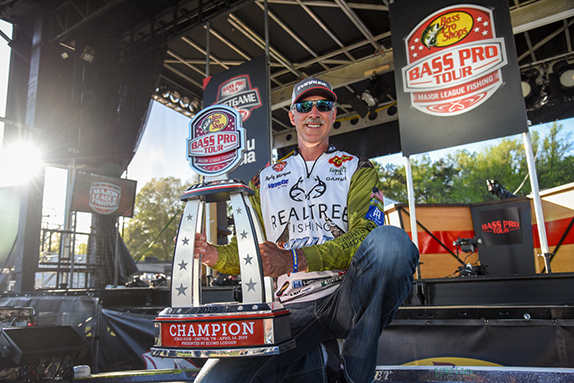 "Two (tournaments) in Texas, one in Oklahoma, one in Alabama and Kentucky Lake � it looks pretty good," he said. "They're all within a day's drive or less, so that part makes sense. "Some of the lakes and rivers are places I've been fishing recently with the (Series) and the Opens, so they're fresh in my mind. If I can get off to a good start, I figure I can do some research on the stuff up north and try to hold it together well enough to make the Classic. That'd be my main goal." Hanselman said he's about 90 percent certain he'll have his initial deposit in for the '18 Elite Series by next week's deadline. His primary sponsor, Three T River Ranch (owned by Texas oil-field supplier Rack Industries), has stepped up with additional funding to cover entry fees, and he's working hard this week to pick up additional backing to alleviate travel expenses. He doesn't view tour-level fishing as a long-term proposition. He has two sons in elementary school (Mason is 9 and Miles is 7) and he plans to be around full-time when they reach junior high. "I'm not looking to do this for the rest of my life � maybe a year or two to get it out of my system and then get back home," he said. "My boys aren't quite teens yet, and when they get a little older, I'm going to need to be there to keep them in line. "(Tour-level fishing) was always a thought I've had, and this year the stars seem to have lined up right. If I can make it work out, I want to give it a shot." He likens his late-entry situation to that of another Texan � former Tampa Bay Rays pitcher Jim Morris, whose improbable journey to the major leagues was the basis for a popular movie ("The Rookie", starring Dennis Quaid). Morris was an ex-minor leaguer who'd gone on to become a high school teacher and coach before rediscovering his fastball in his mid 30s and attending a pro tryout session. "I'll be the old man going out there with a bunch of kids (fellow rookies)," he said. "But actually, I've fished against most of those guys over the years in the Opens and Costas. You've still got to catch them no matter who you are." The Central Open campaign that got Hanselman his Elite invitation wasn't nearly as awe-inspiring as his performance in the FLW Series 2 years ago. His best Open finish this year was an 18th at the Sabine River, and he also had a 22nd at Grand Lake and a 47th at Table Rock. Guiding 150 to 200 days per year, mostly at Lake Amistad, he has an affinity for large baits thrown on stout line. However, he has some finesse skills, too, as he proved recently at the Grand Open, where he employed a shaky-head around docks. "I'd rather not do it � I'll try everything in the world to make them bite something big," he said. "I can do it if I have to, though. "Growing up here at Amistad, it's not strictly one deal; you've got to be pretty versatile. I'd say my weakest point right now is skipping a bait underneath a dock. I'm fine if they're behind the dock or on the edges, but way up underneath there is a different story." He has no significant experience with northern smallmouth, which will be the primary quarry at multiple events during the latter half of the season (i.e. South Dakota's Lake Oahe and the St. Lawrence River in New York). That shortcoming isn't enough to deter him, though. "It's a concern, but you know going in that there will be a learning curve with some of that stuff. I'm not too scared." > Hanselman has made his primary living by guiding for nearly a quarter-century. He does quite a few hunting excursions during the wintertime for clients pursuing the exotic game animals that inhabit a lot of ranches in his home region. > He earned a real estate license a decade ago and sells an average of about one ranch per year. "It all ties together," he said. "Most of the people who've bought a ranch through me were either hunting or fishing customers."